We just returned from a quick trip to Santa Ynez, and it was simply the best. We discovered the region 28 years ago when the parents of a close friend retired there, and we've been stealing away ever since. Santa Ynez Valley is located in the Los Padres National Park, above Santa Barbara, and is an easy 2-hour drive from Los Angeles. It was made famous by the movie Sideways in 2004, and the area really exploded after that. There are currently over 120 wineries in the valley and more are opening all the time. The valley encompasses the towns of Santa Ynez, Los Olivos, Ballard, Solvang & Buellton, with Lompoc, Los Alamos and Santa Maria to the north. Santa Ynez is one of those places that as soon as you drive into the valley, you can feel the stress of urban life melt away. And because it's only 2 hours away, it's an easy day trip for us when the feeling strikes, which is often! In fact, this was the first time in a few years that we actually stayed for two nights. This was a last minute trip that we planned when we realized that friends of ours from Florida would be there for a couple of nights before a wedding in Southern California, so we decided to crash their party. They're sweet, so they didn't mind! We always strategically plan our time there and have our favorites that we always return to. Our typical MO is to drive almost to the end of Foxen Canyon Road and work our way back to town. I'm sharing our favorite stops below that we visited over the two day period, not all at once! We typically visit 3 wineries in a day, with snacks and lots of water between! I'm usually the designated driver since I'm not a big drinker, but I still really enjoy the scenery and vineyards. Cambria Winery is way down almost at the end of the trail, off Foxen Canyon Road. It sits high up and has a gorgeous view of the vineyard. Of course, I didn't get a photo of that, but they have a window into the barrel room from the tasting area and the whole production always amazes me! Los Olivos is a sweet little town just outside Santa Ynez and has many tasting rooms lining the main street. This is actually a really nice way to experience the region without having to drive. Waylan Wine Co. is the new kid on the block in Los Olivos, and they have a gorgeous tasting room. They've only been open for a couple of months but we had a great time learning about their wines and their backstory, plus the host was so enthusiastic, we couldn't help but purchase a couple of bottles in support. They're still young, but they have a lot of potential. Refugio Ranch Vineyard tasting room is another old favorite of ours, and even though it's not politically correct right now, I love their logo. They recently acquired another winery down the street, Roblar, that we visited the next day and had a beautiful picnic on their veranda (see below). For dinner the first night, we tried Leonardo's, located in Solvang, and owned by the former co-owner and chef of Trattoria Grappolo in Santa Ynez. If you saw my Instagram, there was a little story about Chef Leonardo & I from a cooking class 10 years ago - we tried to recreate the photo as best we could, but we've both aged! After dinner, Scott and I had a quick nightcap at the Hitching Post, another throwback from Sideways, and ran into David Crosby as we were leaving! The next day we started at Riverbench Winery, one of our favorites. It's right on Foxen Canyon Road, and is so beautiful. We are members of this wine club and love coming out for the pick up parties, which include small bites, wine and live music. They also have a tasting room in Santa Barbara, in the Funk Zone, which is where we frequently pick up from when we can't make it all the way into the valley. Foxen Winery is an old favorite and now has two tasting rooms on their property. The shack (first photo) is an old favorite, and it quite literally is a shack. It has a ton of character and in the old days, the two winemakers were pouring while three old dogs wandered around. This is another place made famous by Sideways, and they have since opened a newer, larger tasting facility that is quite nice but lacks some of the character of the shack. Roblar Winery is just outside the town of Los Olivos, and has a beautiful patio that is perfect for a picnic. If you forget to bring provisions, they have a kitchen and serve up a small menu that perfectly pairs with their wines. Dinner that night was at SY Kitchen, which is hands' down our favorite dinner spot in Santa Ynez. I neglected to take photos of the meal, but it's a tiny place that seems to always be happening. Plus, we had our second David Crosby sighting there! When we returned home I realized that this is our last getaway of the summer (and summer just started!). That means fun weekend frolics near home before our trip to Scotland in September! A friend of ours is moving across the country in 7 days and starting a new adventure – we’re so jealous! But it gave us an opportunity to swing down to San Diego and surprise her at her going away party on Sunday. Not wanting to miss an opportunity to explore some fun spots, we drove down on Saturday and spent some time hitting some very cool new-to-us bars, restaurants, and stores. And I have to say, San Diego, you’re way cooler than you let us all believe. We stayed with a good friend in Carlsbad, and because we pride ourselves in being the best possible houseguest you’ve ever had, we stopped at Prager Brothers Artisan Bread to pick up croissants & rolls for breakfast the next morning. It’s in an odd location in an industrial area, but this is the real deal. 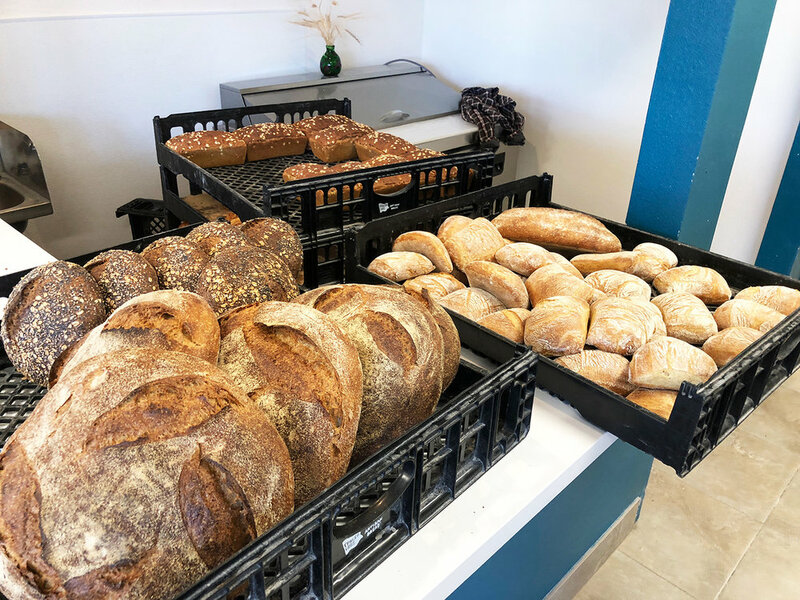 Traditional, natural, organic bread and the croissants have that perfectly baked, golden outside crust with an airy, light center. I could eat a dozen. If you walk two doors down, you’ll find Happy Pantry, which carries all things fermented and has a delicious selection of kombucha on tap. If you’re a local, they also have classes on making kombucha. (If you’re a little further north, a great place to buy fermented goods & learn more is The Fermentation Farm in Costa Mesa). After we picked up our friend Gina, we headed into San Diego proper. I’m a planner by nature and will research a location for hours to find the fun zones. Thankfully, Polite Provisions was spot on. It’s located in an old pharmacy (I love repurposed buildings that keep the old signage! ), and once you walk in, you’d think you were in 1940’s Paris. Even though it was only 5 p.m., the place was packed and we really had to elbow up to the bar. The decor is simple – a brass & marble bar, multiple taps for a variety of cocktails on tap (genius) and bentwood chairs. They’re known for their communal drinks – think, Flaming Scorpion for 6. We did not. But I did have my favorite drink, an old-fashioned (first one in 2 months! ), and not only did it not disappoint, it was gorgeous. They completely elevate the experience by embossing the ice cube (excuse me, what?). Polite Provisions does not serve food, but one of their sister company’s, Soda & Swine, is next door and they will deliver food to the bar. From there we hopped over to Juniper & Ivy, where, without a reservation, we were able to nab a quiet spot in the bar. What a gorgeous restaurant (sorry, no photos, too busy eating). This was just a pit stop to have a quick bite, and Juniper & Ivy has great small plate selections – I’m talking about a Spicy Tuna handroll in a Sesame Leaf, a Biscuit with silly smoked salt & butter and the Baja Yellowtail Tostada with Shark Sauce. Not yet satiated, we drove up to Encinitas and had pizza at Blue Ribbon Artisan Pizza. If you go, you must get the Signature pizza with Lemon EVOO, Fresh Mozzarella, Ricotta, Parmigiano Reggiano, Lemon Zest, Red Onion & Basil. You won’t regret it. On Sunday, we had some time before the going away party and headed downtown to North Park. What a cool little enclave! The residential areas off the main streets are peppered with little Craftsman bungalows, and we had just as much fun driving around and looking at them as we did walking the main street. If you go, make sure to stop at Love & Aesthetics. I’m not sure I’ve seen a better-curated shop, filled with fun gifts, beautiful simple jewelry, oddities, and minimalist decor items. And my rule is, if you find a Matcha Tea shop, you must go in. Holy Matcha is the perfect pick-me-up, hot or iced, sweetened or not. But truth be told, my main reason for wanting to go to North Park is because I have long been a subscriber to the Pigment newsletter, and the little girl in me would have had a serious tantrum if I had been so close and didn’t make it there. Another beautifully curated shop, with lots of fun gifts, cards, stationery, jewelry, candles, and behold, a succulent workshop. I resisted, but I did come home with a few fun items. I love our little weekend excursions. And I love that you don’t have to travel far to have new experiences and explore. I’m hoping to share more of our mini-travels, so stay tuned! It was my husbands birthday last weekend and we wanted to get away, but not too far because we didn’t want the weekend to be all about driving. It’s been ages since we’ve been to Ojai, I knew there were many cool places that had popped up in the last ten years, plus it’s only about an hour and a half out of LA, so we decided to give it a go! And yes, it is incredibly charming. I think it’s still coming into its’ own, but there are so many great spots; restaurants, and shops, not to mention a brand new winery – we had such a great time. We arrived early Friday afternoon and had a quick bite & beer at Azu, which is also home to the Ojai Valley Brewery. It was perfect – Azu prides itself on fresh farm-to-table fare using organic ingredients from local farmers. Our M.O. is to sit at the bar because we really think that’s where the action is! Seriously, we have a great time watching the bartender mix drinks and we usually chat them up on what their specialties are and try for an impromptu craft cocktail class. If it’s an open kitchen, even better I had the Arugula & Dried Fig salad, which was delicious and I dove into before taking the time to snap a photo. 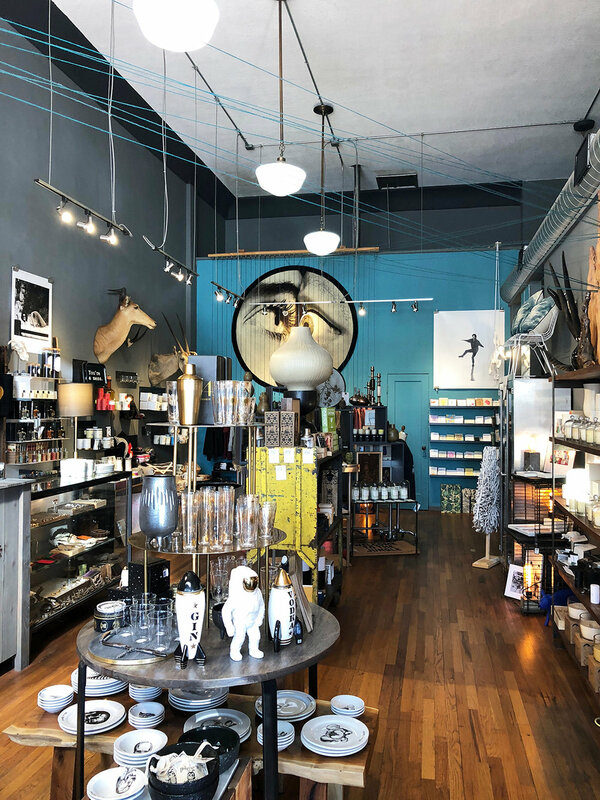 If you wander down Ojai Avenue there are some beautiful boutiques and shops, all a little different with everything from housewares to men’s & women’s clothing, surfboards, and camping goods. So many of the shops have a great vibe and are so perfectly curated, I could live in them. I love the slow pace of this town, everyone is taking their time and it’s a great respite from the craziness of life. You literally can’t help but relax! We made a stop at Topa Mountain Winery, which is on the edge of town. The tasting room has only been open for a year, but it’s a beautiful venue and they produce very nice wines. They were setting up for a charity concert event that evening, so it was a little busy in the back outdoor area. Isn't that entry gorgeous? If we make it back there, I definitely want to come prepared with a picnic! High End: Ojai Valley Inn & Spa – this place is g o r g e o u s, and completely worthy of a splurge. It’s a huge complex with several different restaurants, bars and little enclaves to hang out in. We stopped in after dinner at the Deer Lodge and had a drink at the Wallace Neff Heritage Bar, where a very theatrical bartender was mixing very theatrical concoctions. It was very fun to watch! Mid-Priced: Ojai Rancho Inn – we stopped here to check out their bar, Chief’s Peak, which was packed and full of hipsters (sort of like the Ace Hotel in Palm Springs). We aren’t opposed to bumping elbows with hipsters, we just couldn’t find a place to sit, and couldn’t muscle to the bar so we left. We’ve stayed at their sister hotel in Santa Ynez before, and I would definitely check them out for lodging if we visit again, although we will most certainly be the oldest people there, I am sure. Affordable: AirBnB – this is our usual mode of accommodation these days. Ojai has a city ordinance against short term rentals in town, so most of the AirBnB’s are just outside of town. It was no problem, we were literally 6 miles from town center. The rental we had was a guesthouse in a quiet, private residential neighborhood, was super clean, modern, had a beautiful garden and a gorgeous view. There is no shortage of great places to eat and drink in Ojai, whether you are looking for a quick bite, a nice, romantic dinner or just want to cool off with a drink. Azu/Ojai Brewing Company – fresh farm-to-table fare and a nice selection of local wines. Topa Mountain Winery – beautiful new winery just as you enter the town. They have a delicious Chardonnay, and it’s the perfect setting for a picnic, or go big with a wedding. Chief’s Peak – as I mentioned, we stopped in here but didn’t stay. It’s a young crowd, but we aren’t above that – I’d join the party any day! Looks like a very cool place! Ojai Beverage Company – at first glance upon walking in, you think you’re in a liquor store. A very large liquor store with an amazing selection and very good pricing. If you walk to the back, there’s also a tap room, bar, and restaurant. Suzanne’s – this was the birthday dinner spot, and it did not disappoint. Be sure to make a reservation because everyone in the valley hits this place on the weekend. I had the Salmon with Cilantro Pesto, which was served with steamed vegetables, and it was delicious. Scott had the penne with meatballs, which was good, but the sauce was a little loose. I’m loving the recent influx of simple lifestyle stores that are curated with an eye toward design and bohemian living. In The Field – love this place! Modern bohemian and beautifully curated. deKor & Co. – similar to In The Field, but more home goods and lifestyle oriented. They also carry a small selection of apothecary and I’m kicking myself that I didn’t pick up a perfume that I tried (lesson learned!). Fig Curated Living – this is a little hard to find as it is located down a little alley off the sidewalk between a couple of shops. A portion of it is located outside and is almost home and garden, with an emphasis on local, handmade and fair trade goods. Have you been to Ojai lately? What is your favorite thing to do? Have you ever been to the Poppy Reserve in Lancaster? This year Southern California had a very rainy season, and wildflowers were popping up everywhere - we like to refer to that as a superbloom! Visiting the Poppy Reserve has been on my to-do list for years, but somehow we always miss the blooming season! We finally got a chance to visit last weekend, and just as I imagined, it was spectacular. The Reserve is located in the Antelope Valley of Southern California and is a State Nature Reserve (i.e. part of the State Park system). The park is about 78 miles north of Los Angeles, off of California Highway 14, and very easy to get to. 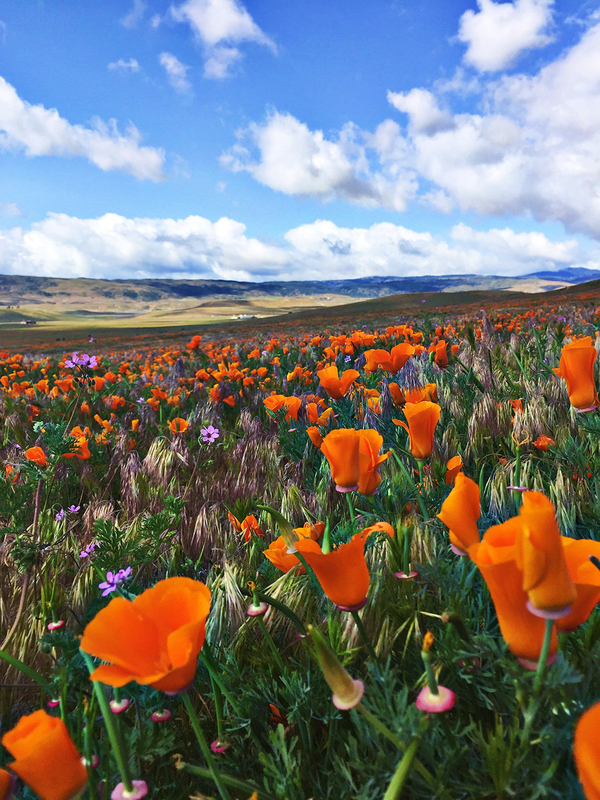 It’s 1800 acres of almost pure orange between late March & early April and is the most consistent poppy-bearing land in California. Besides poppies, tons of other wildflowers share the space, and it truly is a mosaic of rolling hills of color. We visited on a Saturday and luckily got there early, before the big crowds. If you go, I highly recommend an early arrival or try to go during the week. As we were leaving at 11:30 am, the parking lot was full and visitors were having to park outside the reserve and walk in (at least a ½ mile). There are seven miles of dedicated trails that are easy to follow, all of them are loops, and you can go as far as the Antelope Butte Vista Point, which has a gorgeous view. If it’s early in the day, as it was for us, and on the cooler side, you may have to deal with some flowers that haven’t fully opened. This is also the case if it’s cloudy or cold, so be forewarned! If you go later in the day, you inevitably have to deal not only with crowds, but that great Antelope Valley wind that kicks up almost every day! Bring water – the wind is dehydrating! No drones – although that would be a cool experience to see! Check out the Visitors Center on your way out for more information on the wildflowers & wildlife in the reserve – it’s so interesting! The season is definitely winding down, and they’re only expecting the blooms to last another week or two, so if this is on your list, hop to it! With all the rain we’ve had this year, you won’t want to miss the display. We just returned from the most amazing road trip. I’ve had road trip fantasies for years, starting when our kids were young and continuing. We have traveled many of California’s highways, but lately, since they’ve grown, trips via vehicle have been far and few between. This time, we drove from Southern California to Broomfield, Colorado (between Denver & Boulder) for my sisters’ wedding, and it was spectacular. We gave ourselves 3 days going and 3 days coming back, with stops in Zion National Park, Arches National Park, Glenwood Springs, Aspen, Vail, Boulder, and Denver. And I have to say, our world is gorgeous. And I have to say, our world is gorgeous. Admittedly, we could have driven further the first day, but I had an ulterior motive. Recently, Swiss artist Ugo Rondinone installed a large-scale public art display, called Seven Magic Mountains, off the I-15 just outside Las Vegas. We drove by it on a trip out that way in May, and I was dying to explore it up close. I’m intrigued by public art, and this reminded me of the Prada Marfa installation outside the city of Marfa, Texas. This art display is seven towers of stacked boulders, standing over thirty feet high and painted in bright colors. How they are secured is beyond me. We clearly weren’t the only ones with this idea, and it was impossible to get a photograph without any people. Still, it is spectacular in terms of size, depth, and logistics. If you are headed out to Vegas, this is must see. We stomped around for a while in 100-degree heat, I trudged into the brush in an effort to get away from the crowd and get some good photos, and then we continued to Las Vegas, where we spent the first night. On a side note, we visit the area frequently, but always stay outside the city with friends in nearby Summerlin, and actually never go to the strip. So it was fun to actually stay on the strip, and being that we started our trip on a Monday, were able to take advantage of a great rate at the Wynn Hotel & Casino. We were given a corner room on the 27th floor, with a view of the strip from two floor to ceiling windows. This is now my favorite hotel in Las Vegas!